By LINDSAY BARTON Reviewed by WILLIAM P. MEEHAN, III, M.D. 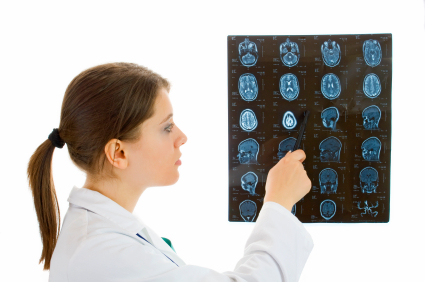 Concussions are typically associated with grossly normal structural neuroimaging studies. In other words, unlike other injuries, concussions are usually injuries no one sees and, contrary to popular belief, don’t show up on most magnetic resonance imaging (MRI) exams or CT scans. As a result, conventional CT or MRI scans of the brain are usually not needed where post-concussion signs or symptoms are mild and clear within a week to ten days. A CT scan is the test of choice to evaluate for the four types of intracranial hemorrhage (subdural, epidural, intracerebral, or subarachnoid) bleeding in the brain, swelling of the brain during the first 24 to 48 hours after injury, or to detect a skull fracture because it is faster, more cost-effective, and easier to perform than an MRI. No test, however, currently available is sensitive and specific enough to diagnose all intracranial injuries. An MRI may be more appropriate if imaging is needed 48 hours or longer after an injury and is best coordinated through your child’s primary care physician or the specialist evaluating your child. Because MRI is viewed as superior in detecting traumatic lesions of the brain, and does not expose patients to radiation, a 2011 study3recommends its use for assessing traumatic sport-related brain injuries, especially after the acute period. The use of CT scans in diagnosing concussion is surprisingly common among neurologists (a 2011 study3 found the CT rate among neurologists at 72.2%), a rate the study’s author and MomsTEAM concussion expert, William P. Meehan, III, MD, said was “probably higher than it needs to be.” Given the results of a a new study reported in the British medical journal, The Lancet4 that children and young adults scanned multiple times by CT have a small increased risk of leukemia and brain tumors in the decade following their first scan, parents should make sure a CT scan is really necessary in treatment of their child after head injury. Source: Halstead, M, Walter, K. “Clinical Report – Sport-Related Concussion in Children and Adolescents” Pediatrics. 2010;126(3): 597-615. 2. Sport Concussion Assessment Tool 2 (SCAT2), Br. J. Sports Med. 2009; 43; i85-i88. 3. Meehan WP, d’Hemecourt P, Collins C, Comstock RD, Assessment and Management of Sport-Related Concussions in United States High Schools. Am. J. Sports Med. 2011;20(10)(published online on October 3, 2011 ahead of print) as dol:10.1177/0363546511423503 (accessed October 3, 2011). 4. Pearce MS, et al. Radiation exposure from CT scans in childhood and subsequent risk of leukaemia and brain tumours: a retrospective cohort study. The Lancet. June 7, 2012 (published online ahead of print).